Manchester United have signed Vitoria Guimaraes striker Tiago Manuel Dias Correia, better known as Bebe. Personal terms have been agreed with the 20-year-old and he will move to Old Trafford for an undisclosed fee. The Portuguese forward had also been closely linked with Jose Mourinho's Real Madrid but he will join fellow new signing Javier Hernandez as Sir Alex Ferguson bolsters the Red Devils' forward line. Bebe made a name for himself at Vitoria after joining from Estrela da Amadora and, despite his tender years, has a strong physical presence as well as technical aptitude, vision and good passing skills. The 20-year-old will certainly also add value to Ferguson with the Premier League's new regulations, as he does not need to be registered in the Red Devil's squad of 25 due to his U-21 classification. Manchester United are set to make a massive bid for French striker Karim Benzema during the summer. Man United chief executive David Gill has confirmed funds would be available for Sir Alex Ferguson to spend and they could splash out £20million for the Real Madrid forward. According to the News of the World, Ferguson will swoop for the 22-year-old who is unsettled in Spain. United were interested in the France international but Real Madrid beat them to his signature. Benzema has since been a bit-part player at the Bernabeu and United are looking to offer him for playing time as a bait to lure him to Old Trafford. United have already signed Mexican striker Javier Hernandez for £8m and Chris Smalling from Fulham for £10m for next season. Wayne Rooney has been named the Professional Footballers' Association Player of the Year while James Milner won the Young Player prize. Rooney's selection ahead of fellow nominees Cesc Fabregas, Carlos Tevez and Didier Drogba means Manchester United have supplied the winner of the prestigious award for a fourth successive year. The 24-year-old has been in sensational form this season, scoring 34 goals for United and eight for England, and is key to the nation's World Cup hopes. "It's a great feeling to win the player of the year award because it's voted for by the players," said Rooney. "It's something I'm really proud of and it's a great honour. "I remember coming here in 2005 and 2006 to win the young player of the year. "I saw the players winning the main one and it's something I've aimed for since." Rooney, who has only just returned from an ankle problem, missed the weekend's 3-1 victory over Tottenham with a groin injury sustained in training. The Barclays Premier League's top scorer with 26 strikes hopes to return for United's campaign finale against Stoke next month and promised he will be fit for the World Cup. "The groin will be fine for the World Cup, there are no worries about that,2 he said. "I'm hoping to play for United in the last game of the season." Rooney, the first Englishman to win the award since Steven Gerrard in 2006, paid tribute to the influence United manager Sir Alex Ferguson has had on his career. "Sir Alex is a great manager who has really brought me on as a player since I joined United," he said. "His hunger passes through to the players. It's great to see that he's pushing 70 and hasn't changed a bit. "I'm sure he'll be here for a long time yet." Rooney was also nominated for the PFA Young Player of the Year, but that award went to James Milner of Aston Villa. Milner appears to have played himself into Fabio Capello's World Cup squad with a string of stellar performances and the 24-year-old midfielder credited a change in position for his success this season. "I've been moved into the middle and that suits me as it helps me influence the game a bit more," said Milner. "Maybe sometimes wide right you want to influence the game but you just can't get yourself into it." Leeds legend and former South Africa captain Lucas Radebe, 41, won the PFA Merit award. "I'm very proud to get such a great award. Sport can change the world - football has played such a big part in lifting my community," said Radebe. The PFA divisional team of the year contains four United players, spearheaded by Rooney. Arsenal, whose title challenge fell away in the final rounds, supply Fabregas and Thomas Vermaelen and there are also two from Chelsea in Drogba and Branislav Ivanovic. The inclusion of Milner and Richard Dunne means Aston Villa are represented twice as well. Premier League team of the year: Hart, Ivanovic, Vermaelen, Dunne, Evra, Fabregas, Milner, Fletcher, Valencia, Rooney, Drogba. Sir Alex Ferguson praised Manchester United's "ghost" for raising their spirits in the Barclays Premier League title race. Veteran midfielder Paul Scholes celebrated the signing of a one-year extension to his contract with a dramatic winner in the derby against Manchester City. Three minutes into stoppage time he got on the end of a cross from Patrice Evra to flick a header beyond goalkeeper Shay Given. 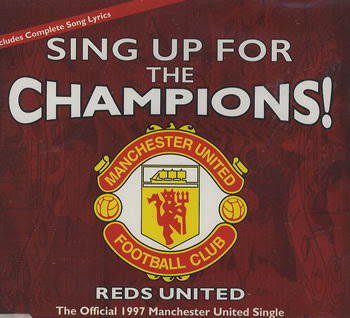 With Scholes rolling back the years, United are still in with a chance of a record fourth successive title. 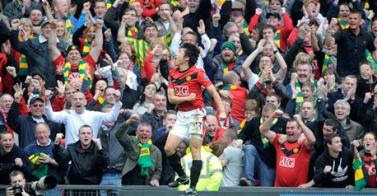 Ferguson said: "It was an amazing finish. We have three last-minute goals against them now (this season) but deserve it. "We had the best chances but it did not look like anyone was going to win. The game became very open in the last 10 minutes. "That gave us the chance to get players forward and there is none better at that than Scholes. I'd almost given up and thought it would be 0-0. "You know with us it's happened so many times we score late and you always hope it will happen again. "I decided to put Scholes a bit further forward and it paid off. "No-one is better than him at ghosting into the box. There was no-one near him and it was a free header. "He was man of the match today, he was wonderful, he's such a skilful player." Scholes said: "I think we were the team pressing to try to score and fortunately we were lucky enough to win the game with not much time left. "It's nice to win any game against City, and away from home especially." With Wayne Rooney back after an ankle injury United carved out a number of chances but were unable to convert any of them until Scholes struck. The England striker looked frustrated and was replaced in the second half by Dimitar Berbatov. That came shortly after he was left rolling on the floor following a challenge from Vincent Kompany, which saw the City player booked. Rooney suddenly recovered, then raced away and Ferguson said: "I asked him why he got up. "He said it was because he thought Kompany was getting sent off so he jumped up. Then the crowd booed. It's a cruel world." Ferguson added: "We wanted to keep a clean sheet because we know if we get back to zero against it gives us a chance. One-nil wins have played a big part in our title wins and 1-0 today shows that's true. "Derbies are derbies and the way we have won has given our supporters great excitement. To do it that way on City's own ground is a great result for us." Sir Alex Ferguson will persuade Manchester United chiefs to part with £60million to purchase Karim Benzema and David Silva. The Red Devils have endured a tough week having crashed out of the UEFA Champions League at the hands of Bayern Munich before seeing their Premier League title challenge derailed by a scoreless draw at Blackburn Rovers. The Sun reported that the Scotsman is refusing to sound the alarm bells as he continues to insist that only minor tweaking needs to be done when it comes to the depth of his squad. Real Madrid striker Benzema is reportedly a top priority despite his reluctance to move away from the Bernabeu while Valencia's pacy winger David Silva is the other player Ferguson is monitoring. Both players could have no option but to move with Valencia in a financial conundrum while Benzema cannot seem to find regular playing time at Madrid. In defence, Fulham's Chris Smalling will move to United at the end of the season as a readymade replacement for the ageing Rio Ferdinand while more firepower in the form of Mexican hotshot Javier Hernandez from Chivas. It remains to be seen if the Glazers will give Fergie the huge transfer kit he has requested for. 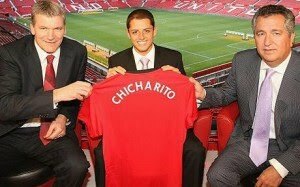 Manchester United is pleased to announce it has reached agreement with Mexican club, Chivas de Guadalajara for the purchase of 21 year-old Mexican striker Javier Hernandez, better known as “Chicharito,” for an undisclosed fee, subject to a successful application for a UK work permit. Personal terms have been agreed and Javier passed a medical in Manchester this week. The application for the work permit will be submitted shortly. 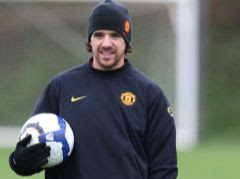 If a permit is granted, Javier will become a Manchester United player on 1 July 2010. As part of the deal, the Club will play a match to open the new 45,000 capacity Chivas Stadium in Guadalajara as part of its 2010/11 season preparations. Sir Alex Ferguson said: "I am delighted to reach agreement with Chivas to bring such an exciting young striker, who has been in such prolific form for both his club and his country. He will be a great addition to our squad and we look forward to welcoming our first Mexican player in the summer. “We are equally excited to play our first game in Mexico, opening the magnificent new Chivas Stadium in July." Sir Alex Ferguson slammed the behaviour of the Bayern Munich players after Manchester United's Champions League exit at the hands of the German side. United, who lost on away goals having won 3-2 on the night, appeared to be cruising through when they led 3-0 after 40 minutes thanks to goals from Darron Gibson and Nani (two). But Ivica Olic slotted home just before the break for Louis Van Gaal's side. Rafael was dismissed for a second booking early in the second half and a stunning volley from Arjen Robben saw the visitors progress on away goals as the tie ended 4-4 on aggregate. Ferguson was furious about the manner in which the Bayern players had put pressure on referee Nicola Rizzoli to show Rafael a second yellow card after tugging back Franck Ribery. When asked if the sending-off had changed the course of the game, Ferguson told ITV1: "There is no doubt about it. They were never getting through that tie, with 11 men we had no problem. "The young boy showed a bit of inexperience, but they got him sent off, everyone sprinted towards the referee - typical Germans." The Scot also believed United had been the better side across the two legs. "We played better today than they did in their own ground. Without the extra man they made the ball work and I thought we defended very well, it's taken an exceptional strike to settle the tie. "We have done well, the performance was excellent, we were very unlucky." 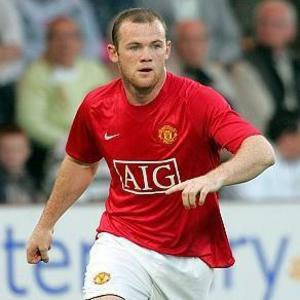 Ferguson also played down any fears that Wayne Rooney had suffered a recurrence of his ankle injury. The England striker was a surprise starter at Old Trafford but was soon limping after being caught in a challenge, he was eventually substituted after 55 minutes. "We will have a look at it," Ferguson said. "I don't think it is serious. It's just that tissue and the blood vessel has just burst. I am sure he'll be fine for the following week." We pick out some of the key one-on-ones to look out for in the crunch game between Manchester United and Bayern Munich. With Sir Alex Ferguson opting for youth before experience, Rafael will replace Gary Neville as the man to man-mark Ribery. The Frenchman was all over Neville in the first half of the first leg - running the veteran into the ground with his pace and trickery on the flank. Rafael's stamina will give United a huge advantage, but the youngster will have to curb his penchant for going on attacking runs and leaving wide open spaces behind him. If the past is anything to go by, Rafael hails from the Paul Scholes School of tackling - and he'll have to be very careful not to go in stabbing with his leg when Ribery is in and around the penalty box. Carrick will likely replace Scholes, who played the full 90 minutes in the first leg. The younger midfielder will be up against the highly experienced Van Bommel. The Dutchman was relatively quiet in the first leg except for one exhilarating run which culminated in Edwin van der Sar having to make a brilliant save. However, the Bayern captain is incredibly versatile - capable of stemming opposition attacks as well as setting forth his team on the counter. Carrick will have to shadow him all over the pitch to make sure the indefatigable Van Bommel does not dominate the midfield. Berbatov looks lazy. But some people think he does it to lull the opposition into a false sense of security. It might be sacrilege to say this - but on his day the Bulgarian is probably as good as Rooney in front of goal. For his part - Dimechelis looked like the court jester in the majestic Allianz Arena during the first leg. His clumsy slip allowed Rooney to sneak in for the opener and the defender was constantly caught out of position from crosses and long balls. While he will most likely not have to deal with the all-action Englishman this time, Berbatov can make shaky defenders wish they had never been born. The Argentinean will have to be on the lookout for the clever flicks, lobs and nutmegs that Berbatov has made a living out of. 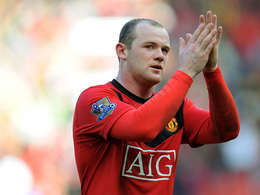 Sir Alex Ferguson has revealed that Wayne Rooney could return for Manchester United against Manchester City on April 17. The striker is currently sidelined with an ankle problem picked up in the Red Devils' 2-1 defeat to Bayern Munich last Tuesday. Fears were raised as to his long-term fitness the moment he hobbled out of the Champions League quarter-final clash at Allianz Arena. Relief for United and England came with the news that he was only expected to be out for up to three weeks, but his absence could yet put paid to the Red Devils' hopes of landing major silverware this term. Understandably, they are keen to have Rooney back in action as quickly as possible and Ferguson is hoping his talisman may return for a crucial derby encounter at Eastlands later this month. "I think he will be back at the most in three weeks and we have earmarked the game at Manchester City," said the United boss. "There will be time for him to still have a big impact on our season. "Hopefully if we get past Bayern Munich he would be available for the semi-finals." United welcome Bayern to Old Trafford in the return leg of their last eight contest on Wednesday. Rooney will definitely play no part in that fixture, as Ferguson's men look to turn the tie on its head, but veteran goalkeeper Edwin van der Sar is confident the Red Devils can prevail without their leading forward. "The one thing we know about Bayern is that they will be mentally strong - as they were in the first leg after we scored first," said the Dutchman. "It's a very German strength, of course. They are very fit and they have a belief in themselves that keeps them going right until the very end. "And having (Louis) Van Gaal as their coach will have only added to their quality and belief because I know from experience he is a man who leaves nothing to chance. "He is someone I have a great deal of respect for, and I know he will have Bayern set up the right way to get a result to go through at Old Trafford. "The thing is, we also have a very good coach - and Ferguson knows what will be in Van Gaal's thoughts even better than I do. "We have the experience to progress beyond Bayern and we also have the quality. "And even though we were disappointed to lose the first game in the last minute, we know we can win even without Rooney." And the reds go marching on, on, on. Both Liverpool and Blackburn were the victors as they came away with wins over Sunderland and Burnley respectively. A scintillating first-half performance set the tone for an easy 3-0 Liverpool victory over Sunderland at Anfield which kept the Reds in the race for Champions League qualification. Fernando Torres struck a brilliant opener in the third minute and Glen Johnson's deflected strike made it 2-0 after a first half in which the hosts could easily have scored six. Torres scored his seventh goal in four matches, and his 18th in 21 Premier League appearances this season, midway through the second half as Liverpool coasted in the latter stages. Victory takes the Reds back above Manchester City and into fifth place, four points adrift of fourth-placed Tottenham. A controversial David Dunn penalty earned Blackburn a 1-0 win at Lancashire rivals Burnley, effectively ending any lingering relegation fears for Rovers while leaving their opponents deeper in the mire. Blackburn are now through the 40-point barrier and into the top half of the table while Burnley, on 27, stay in 19th spot and three points adrift of safety. But Burnley will rightly feel aggrieved at Mike Dean's decision to award the decisive spot-kick as Martin Olsson appeared to dive over Brian Jensen with little or no contact. Burnley huffed and puffed in the second half in search of an equaliser, but Blackburn came closest to adding to the goals column as his shot cannoned off the underside of the bar and just failed to cross the line. On Saturday, Manchester United and Chelsea recorded big wins while Arsenal dropped two points at St. Andrews against Birmingham. Manchester United romped to a 4-0 win despite both Wayne Rooney and Rio Ferdinand being absent. It was a fitting riposte to Chelsea stunning 7-1 mauling of Aston Villa earlier in the day. Bolton made a fist of things for the first half hour and could even have taken the lead had it not been for excellent reflexes from Edwin van der Sar. United finally went ahead courtesy of an incredible own goal by Jlloyd Samuel. The defender sidefooted the ball into his own net when he had plenty of time to clear it. It was 1-0 at the break. United emerged from the tunnel in the second half a side on a mission. They started going through the gears and a through ball from Ryan Giggs found Fletcher in space. The midfielder's shot was parried straight into the path of Dimitar Berbatov who eased the ball past Jussi Jaaskelainen. It turned into the Nani show after that. The Portuguese, playing high on the left side of midfield tormented Samuel Ricketts twice before squaring the ball to Dimitar Berbatov and Darron Gibson. Neither made any error from close range and the Devils ultimately ran out comfortable 4-0 winners. At Stamford Bridge, Carlo Ancelotti raised eyebrows by leaving Didier Drogba on the bench but the result was the biggest win of his side's season and one which took them back to the Barclays Premier League summit. And Chelsea's cause was further boosted when Arsene Wenger's men blew three hard-earned points against Birmingham, with Kevin Phillips cancelling out Samir Nasri's opener at the death. Lampard opened the scoring for Chelsea in the 15th minute but nerves were evident in the way the home side allowed Villa to hit back and level when John Carew converted Ashley Young's cross in the 29th minute. Lampard's penalty nudged his side back in front just before the break then Chelsea ran riot with a brace for Florent Malouda, one for Salomon Kalou and two more for Lampard, who notched his fifth career hat-trick in the process. It was a different story for Arsenal who had to battle through every minute of their clash with Alex McLeish's men but looked to have clinched it when substitute Nasri rocketed home a right-foot shot nine minutes from time. Home keeper Joe Hart had been in good form to deny Theo Walcott in the first half but Birmingham also had their chances and Scott Dann missed a simple rebound after Roger Johnson's flick-on had hit the crossbar. Wenger's introduction of Nasri and Andrei Arshavin in the 69th minute breathed new life into the Gunners and looked to have paid off handsomely with Nasri and Cesc Fabregas coming close to adding a second. But the visitors' title push suffered a major blow in the first minute of added time when an attempted clearance in the box struck Phillips and the ball proceeded to loop back over Manuel Almunia into the net. Tottenham took a firmer grip on the final Champions League place with a 2-0 win over Portsmouth at White Hart Lane with Pompey old boys Peter Crouch and Niko Kranjcar grabbing the goals. Crouch headed home a Gareth Bale cross in the 27th minute and Spurs dominated with Michael Dawson crashing a long-range shot wide and Crouch and Tom Huddlestone both hitting the woodwork. Kranjcar converted a Kyle Walker cross after 40 minutes and things got worse for doomed Pompey in the second half with both Hermann Hreidarsson and Danny Webber stretchered off. Gianfranco Zola's West Ham sunk deeper into the relegation mire after a dismal 1-0 home defeat to Stoke and their cause was not helped by fellow strugglers Hull's 2-0 win over Fulham. Zola's difficult week ended on a new low note with Ricardo Fuller grabbing the only goal of the game at Upton Park, beating three Hammers defenders before firing the winner in the 69th minute. Iain Dowie's men are now behind the Hammers on goal difference only after cruising to victory over Fulham with a 16th-minute penalty from Jimmy Bullard and Craig Fagan's 48th-minute header. Wolves edged closer to safety after hanging on for a goalless draw at home to Everton, for whom Leighton Baines and Leon Osman came close while Ronald Zubar shot just over the crossbar for Mick McCarthy's men. Torres: We have confidence now! Owen Hargreaves will start full training with United's first team, and Sir Alex Ferguson is keen to get the 29-year-old involved in the title run-in. "Arsenal and Barca best in Europe"
According to West Ham boss Gianfranco Zola, Arsenal and Barcelona are currently playing the best football in Europe. In comments reported by the Daily Mirror, Zola said: "When we played Chelsea last week they probably didn't play with the same quality or intensity as Arsenal. Arsenal are terrible, if you leave them a little bit of space because they punish you." "Arsenal, along with Barcelona, are the team who are playing the best football in Europe probably. They are very good to watch." Zola was unsure however about Arsenal's ability to sustain their quality until the end of the Champions League campaign. "Whether they are going to be able to do that until the end I don't know. That is the question that everybody is asking." "Arsenal played some good football but there were some moments when we matched them completely. Arsenal and Chelsea are both good teams and they will be in contention until the end that is for sure," concluded the Chelsea legend. Carlo Ancelotti admits that Manchester United are the favourites to win the Premier League after Chelsea’s 1-1 draw against Blackburn. The Blues have dropped to third spot after the draw, and are outside the top two for the first time this season. Chelsea's inability to secure maximum points against Rovers, along with Arsenal and Man United's wins, sees the Blues two points behind the Gunners and four points behind the Red Devils, and Ancelotti has revealed that his side is facing an uphill battle to bridge the gap. 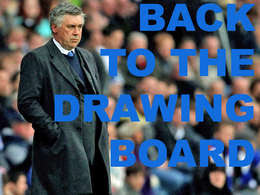 "Manchester United are top of the league so are now the favourites," Ancelotti told the Daily Star. "It will be more difficult now to win the title, but it is not impossible. "This is not an easy moment for us, but we must not lose our confidence." With Sunday's draw coming hot on the heels of their exit from the Champions League at the hands of Inter Milan, Ancelotti knows that a victory against Portsmouth on Wednesday is needed to resurrect Chelsea's flagging dream of silverware this season. "Now we are third, it means we have to run more. "We need to regain our momentum. "But I still think we can do it although we must win our next game." Park's superb diving header gave United a 2-1 victory over Liverpool at Old Trafford. (CNN) -- Park Ji-sung headed a second half winner as Manchester United beat bitter rivals Liverpool 2-1 to reclaim top spot in the English Premier League on Sunday. Spanish international striker Fernando Torres gave Liverpool a shock fifth-minute lead at Old Trafford, but Wayne Rooney quickly equalized from the penalty spot. The goal came in controversial circumstances with Javier Mascherano's foul on Antonio Valencia appearing to start outside the area. Rooney's initial spotkick was saved by Pepe Reina, but the England striker continued his rich scoring vein by hitting home the rebound in the 12th minute. In a second half of few openings, South Korean star Park dived to power home the winner on the hour mark from man of the match Darren Fletcher's superb cross. Torres, who had started and finished the move to put Liverpool ahead, fluffed a great chance to equalize in the the last minute, but his shot ballooned high and Yossi Benayoun could only head it straight at Edwin van der Sar. The win takes United two points clear of Arsenal on 69 points after 31 games. Third-placed Chelsea were later held to a 1-1 draw at Blackburn to be four points adrift, but with a game in hand. It was another setback for Chelsea, who were knocked out of the Champions League by Inter Milan in midweek. Didier Drogba gave Carlo Ancelotti's men an early lead at Ewood Park as he neatly converted Nicolas Anelka's cross, but they were unable to press home their advantage. El-Hadji Diouf equalized for the home side in the 70th minute when he rose above Paulo Ferreira to cleverly direct Michel Salgado's cross past Petr Cech. Fletcher claimed their earlier victory over Liverpool, who are battling with Tottenham, Manchester City and Aston Villa for the final Champions League spot, had put the pressure on Chelsea. "The team that puts the most consistent run to the end of the season will probably be the champions," Fletcher told Sky Sports. United's city rivals Manchester City also enjoyed a crucial 2-1 win on Sunday as they beat Fulham at Craven Cotage. Fulham were feeling the effects of their famous win over Juventus in midweek and fell behind to first half goals from Roque Santa Cruz and Carlos Tevez, who starred for the visitors. Fulham captain Danny Murphy pulled one back from the spot in the 75th minute but they could not force an equalizer. City move above Liverpool into fifth place, two points adrift of fourth-placed Tottenham, but with a game in hand. Holders FC Barcelona cruised into the UEFA Champions League quarter-finals, equalling VfB Stuttgart's record defeat in Europe thanks to two goals from the sublime Lionel Messi. Level at 1-1 after the first leg, Stuttgart had been giving a fine account of themselves before the roof caved in. The visitors were emboldened by their ease of stringing passes together but on 13 minutes were caught on the break when one went astray. Yaya Touré galloped forward, fed Messi and the No10 did the rest, taking Zdravko Kuzmanović for a walk, then slamming a shot between two defenders and high into Jens Lehmann's top-right corner. The Camp Nou roared; Guardiola sprinted to the touch line and gave instructions to Gerard Piqué. He wanted Andrés Iniesta and Sergio Busquets to switch touchlines, they did and the second goal arrived. Six quick-fire passes involving the pair, plus Pedro and Messi, ended with the Argentinian international bending the ball into the path of Touré, whose pass was steered in by Pedro. This time the movement and the culmination were so thrilling that even Guardiola danced a little jig on the touch line. Just before the half-hour it could have been 3-0. Touré was relishing his unusual wide role and again broke free on the left, outstripping Stefano Celozzi and sliding a tantalising cross in front of Jens Lehmann – Thierry Henry failed to convert it by a matter of millimetres. Messi would not be overshadowed for long, however. Stuttgart were more brusque after half-time, trying to suffocate the forward, but he soon found space. Dribbling brilliantly, he sucked in three defenders before squaring for Touré to drive narrowly wide. Messi was unstoppable. On the hour Daniel Alves flicked Pedro's pass to him and, from outside the box, he crashed in his fourth UEFA Champions League goal of the season. His hat-trick nearly arrived courtesy of an Alves cross in the 66th minute but Messi's header, reminiscent of the one with which he sealed victory in the final against Manchester United FC last May, brought a fine save from Lehmann. The show rolled on as Zlatan Ibrahimović had a goal ruled out, the goalkeeper again had to save well, from Iniesta this time, and Messi ran half the pitch before clipping wide. "Si, si, si, nos vamos a Madrid" the Camp Nou faithful roared – looking beyond Friday's draw for the last eight and to the final on 22 May. A great deal of work remains before that, but on this form few would doubt Barça achieving it. The holders underlined those credentials when substitutes Ibrahimović and Bojan Krkić combined for the fourth in the last minute, the Sweden striker releasing his team-mate for a right-footed finish. Jose Mourinho made a triumphant return to Stamford Bridge to dump his former club out of the Champions League. Inter, leading 2-1 from the opening leg of this last-16 tie in the San Siro, secured their place in the last eight when Samuel Eto'o scored the winner at Stamford Bridge in the 78th minute. Chelsea's campaign ended in more misery when Didier Drogba was sent off in the 87th minute for a crude moment of petulance, appearing to stamp on Thiago Motta. Mourinho, who never lost a home league game during his time as manager at Chelsea, had begun the evening with a low profile entry from the tunnel and into his dugout seat. Chelsea fans responded with warm applause but Mourinho refrained from hogging the limelight. He knew he and his team had a job to do. Mourinho had cleverly picked an attacking side with Eto'o, Diego Milito and Goran Pandev up front, and his plan worked superbly. They set about the task of preserving their one-goal advantage from the opening leg in the San Siro with a determination and energy rarely associated with Italian teams. They closed Chelsea down with alarming efficiency for much of the half and squandered a gilt-edged opportunity to pile on the agony for the English side. But when the home side did get into gear, there was enough encouragement to suggest the deficit could easily be wiped out. In the 11th minute, Michael Ballack collected a pass from Frank Lampard and sent a 20-yard low drive just wide of the post. But it was an isolated moment. The low intensity of the game was briefly interrupted in the 15th minute when Florent Malouda was kicked in the face by Lucio. Drogba quickly squared-up to the Inter defender before referee Wolfgang Stark, who had a poor game, restored calm. But the Serie A side were doing everything to protect their lead and Maicon was the hero in the 25th minute when he blocked a shot from Drogba. Milan responded with the miss of the half from Eto'o. 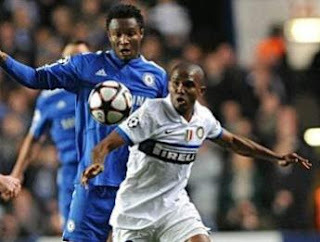 Maicon's cross eluded Chelsea captain John Terry and fell straight to the Inter striker at the far post. But instead of planting his header into the net, Eto'o headed the ball down and over the cross bar. It was a real let-off for the home side who then had two penalty claims rejected within minutes. First Motta escaped when he rugby-tackled Branislav Ivanovic and moments later Walter Samuel was guilty of an atrocious challenge on Drogba as the Ivorian attempted to lose his marker from a corner. Amazingly, Stark missed both offences and Motta then cleared off the line after Nicolas Anelka had turned a pass from Drogba towards the empty goal. It had been a frustrating half for the English side and more of the same was dished-up in the second period. Malouda briefly threatened to take the game to the Italians and his trickery earned Motta a booking in the 47th minute. It was a yellow card that will keep him out of the quarter-final. The France winger, the architect of West Ham's downfall in the Barclays Premier on Saturday, then forced Julio Cesar into a fine save at his near post. Lucio was also booked by Stark and he too will miss the first-leg of Inter's quarter-final tie. But as the second-half wore on, Milan began to exploit Chelsea's nervousness. Yury Zhirkov produced a sensational block tackle to prevent Goran Pandev from putting Milan in front on the night and in the 65th minute Diego Milito put his shot wide with just Ross Turnbull to beat. Moments later Motta headed over the bar from close range as Mourinho's side edged closer to the last eight. The goal they had threatened throughout the second half finally arrived in the 79th minute when Eto'o collected a superb pass from Wesley Sneijder and ran on to fire past Turnbull. Mourinho allowed himself a short run out of his dugout but then remembered his pledge not to celebrate and walked back to his seat. Chelsea, who had never looked like scoring in the second half, now had to get two - a task that was clearly beyond them. It got worse for Chelsea in the 87th minute when Drogba was given a straight red card for a lunge on Motta, seemingly raking his studs down the midfielder's calf after the ball had gone. Inter wasted another chance in the closing stages when Eto'o's shot was superbly saved by Turnbull. But it was all academic in terms of the result and with a minute of added time to go, Mourinho ended the game with a low profile exit. The former Chelsea boss watched the closing seconds from the sanctuary of the tunnel and disappeared at the final whistle to leave the glory and celebrations to his victorious team. HELSINKI: Former England captain David Beckham will undergo surgery at a Finnish hospital on Monday afternoon on a ruptured Achilles tendon that looks set to rule him out of the World Cup. "He will arrive in the afternoon, between 3:00 and 4:00 pm (1300-1400 GMT)," orthopedic surgeon Sakari Orava told AFP. England manager Fabio Capello said he had spoken to Beckham and that the 34-year-old looks set to miss this summer's World Cup after picking up the career-threatening injury in AC Milan's 1-0 Serie A win over Chievo. 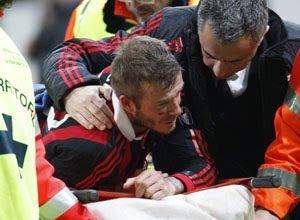 Beckham twisted his left ankle during the final minutes of the match at the San Siro and limped off the field before being stretchered away in pain and in tears. Orava explained that the operation at the sports injury clinic of Mehilaeinen hospital in the western city of Turku would take less than an hour. "It seems the problem is his Achilles tendon. We will have to see whether it's completely severed, partly severed, or something in between," Orava said. "His recovery will depend on what kind of an injury this is, but it will likely take several months before it is completely healed," Orava said, adding Beckham could likely begin "light training" in a couple of months. Asked about Beckham's prospects of recovering in time to compete in his fourth World Cup in South Africa, Orava said this "seems a little uncertain, even though I haven't seen him yet." The World Cup gets underway on June 11. Beckham was expected to remain in Finland for "a minimum of a couple of days" to recover, Orava said. Orava added he had previously only seen Beckham on television, but had treated the football legend's teammates from AC Milan and England. The Achilles tendon connects the calf muscle to the bone in the heel and is the most commonly torn tendon in the body. The tendon is usually torn when the leg is straight and the calf muscle contracts. It typically takes several months for athletes to fully recover. Tearing the Achilles tendon can happen without major incident, particularly in athletes whose bodies are under the continual stress of training. The injury is most common in tennis, soccer, basketball and running. A study published this year found that one third of NFL players who hurt their Achilles tendon never played professionally again. People who tear their Achilles tendon have major swelling and are unable to put weight on their ankle or foot. Certain medications increase the risk of tearing the Achilles tendon, like antibiotics or medicines to reduce inflammation like corticosteroids. Doctors typically fix torn Achilles tendons with surgery. After the operation, patients are outfitted with a cast or brace to help the tendon heal, for about six to eight weeks. MANCHESTER: Wayne Rooney menegaskan membantu Manchester United menikmati kempen paling berjaya musim ini adalah lebih penting daripada mengejar rekod jaringan Cristiano Ronaldo berjumlah 42 gol semusim. Rooney diminta mengisi kekosongan ditinggalkan penyerang Portugal itu selepas Ronaldo dipancing dengan harga 80 juta pound (RM448) oleh Real Madrid, tahun lalu. Dan penyerang England itu melakukan tugasnya dengan baik, menerusi larian kencang ke dalam kawasan gol lawan dan membantu menghidupkan peluang United dalam saingan Liga Perdana Inggeris dan Liga Juara-Juara Eropah. Bekas penyerang Everton itu mengumpul 24 gol dalam 22 perlawanan terakhirnya dan dua lagi gol ketika kemenangan 3-0 ke atas Fulham di Old Trafford menjadikan keseluruhannya kini kepada 32 gol. “Secara jujur itu bukan sasaran dan saya juga tidak memburunya. Memang bagus dapat menjaringkan gol dan saya mahu melakukannya dalam setiap perlawanan tetapi apa dilakukan Cristiano itu memang sukar dipercayai. United mendahului dua mata di puncak carta liga selepas kemenangan ke atas Fulham dan dengan Chelsea dan Arsenal juga menang Sabtu lalu, Rooney berpendapat tiga mata itu cukup penting.